Enter your billing information so you can go live with your Bing Ads campaigns. Before your campaigns can go live and your ads run, you need to make some choices about how you are billed. If you create ad campaigns for your own business, it’s more common to set up postpay threshold accounts, which means you pay for clicks after charges add up and not ahead of time. 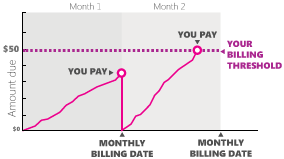 For other billing options, including prepay and monthly invoice, see What are my billing options? Pay now or pay later. With postpay threshold accounts, Bing Ads automatically bills you on your monthly billing date (the date of the month you signed up) or when your charges reach a specific amount, whichever comes first. This predetermined amount, called your billing threshold, is the credit limit of your account. As you make payments, your billing threshold will increase. Read more about billing threshold. When you’re ready to go live with your Bing Ads campaigns, you’ll need to set up your billing information. Remember, with Bing Ads pay-per-click advertising, you’re not charged until someone clicks your ad. Click Add card or another payment method of your choice. Select the country of your billing address, and then select your billing options, including how you pay (payment setting) and what you pay with (payment method). Enter the required information based on the payment method you select.